Gustavo and Colin are much earlier risers than I am, but they seemed content to hang around a bit longer for an 8:30am departure. The morning was crisp and clear with no rain in the forecast for the day. US-50 was a nice ride over the Austin Summit down into the next valley. Eureka (I found it), Nevada was the next town on the highway, some 70 miles away. Once we got there though, I’m not sure what we found other than gas. If you blink you’ll miss it, but for those with limited range bikes, it’s a long haul from Austin to Ely of about 160 miles. After Eureka, Gustavo and Colin started to pull ahead as I wanted to take a few more pictures and run at a bit of a more relaxed pace. 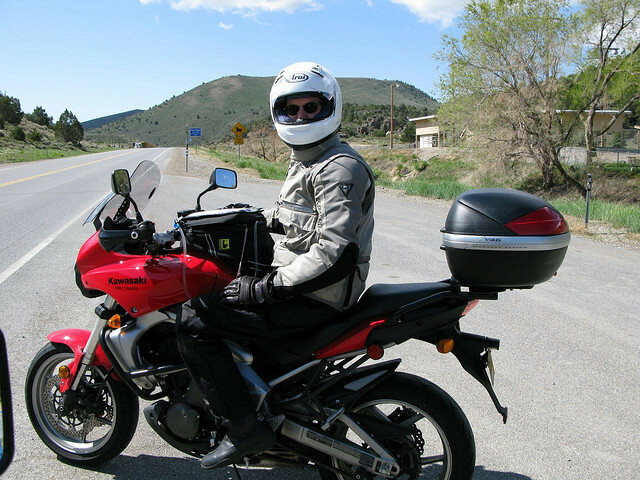 Colin has a beautiful CBR1000 bored to 1100 and all tricked out. He claims to have gotten a ticket going 170 in a 65. Yeah, that one really hurt: $1700 but no jail time. 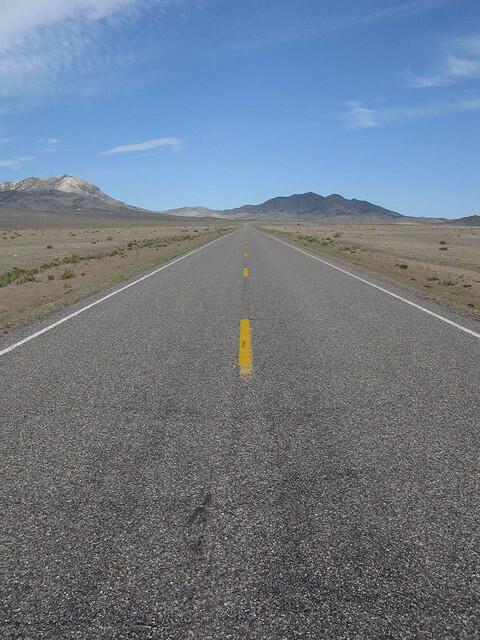 The eastern half of US-50 in Nevada is a lot like the western side, long valleys with short mountain passes. After my experience in Death Valley thinking it was all boring but leaving thinking it was pretty cool, I focused on seeing the beauty here. Going up and down in elevation the vegetation thins and thickens, getting thicker as you go up. My hunch is that it’s so hot, the the plants prefer the colder winter and mild summer you get at altitude. Somewhere just outside of Ely, I spot some snow capped mountains so I stop to get a picture. A construction crew was working on a bridge just down the way. One of the workers starts walking my way. I figure there’s some rule saying you can’t stop within X feet of a construction zone. Turns out he was just interested in the bike. 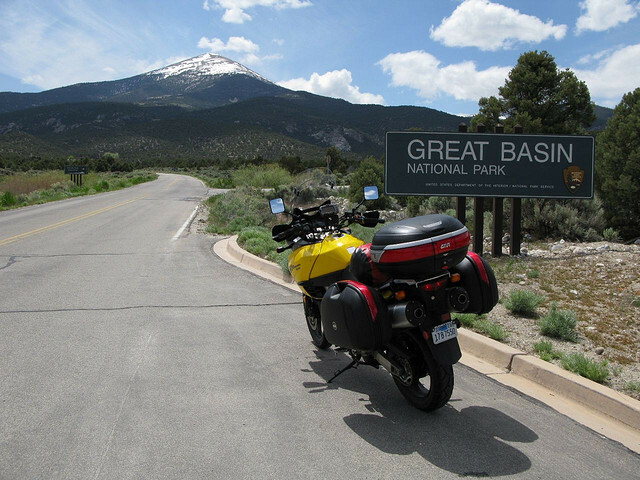 The V-Strom and Triumph Tiger are “similar” bikes. He thought I was on the Tiger. We talk bikes for 10-15 minutes. Gustavo and Colin are sure to be waiting for me in Ely, so I say goodbye to Anthony and head for town. Probably because of the name coincidence, I started to think a lot about my new nephew Anthony. He was born back in January, but I’ve not seen him yet. I often came back to what his path in life is to look like, what his dreams in life are. After cresting the 30 year old mark I’m realizing that you only have one shot in life, so you’ve got to make the most of it. Seeing both Anthony and Lisa grow up has brought a new awareness, not necessarily urgency, that each day does count. Knowing that, I need to follow what my own passions are, not those others may project ahead for me. After leaving Ely, the three of us split up as Colin was going to Salt Lake for the races, Gustavo was going to Cedar City via 93 and I wanted to see Great Basin park. The park was all the way on the Nevada/Utah border and one of those places I’ll probably never see again. Mt. Wheeler, just cresting over 11.000 feet, was one of the major features (as well as the Lehmann Caves but I wasn’t up for caving). The road up to the summit was in stark contrast to just about everything else I’d seen in Nevada. The road was tight, windy and slow going with 5,000 feet in elevation gain in just under 12 miles. At the top however, wow. 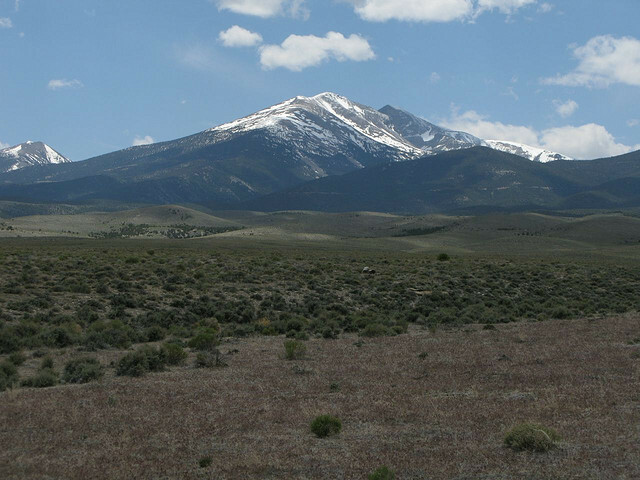 The summit was covered in snow and the surrounding mountains made for a truly spectacular visit. 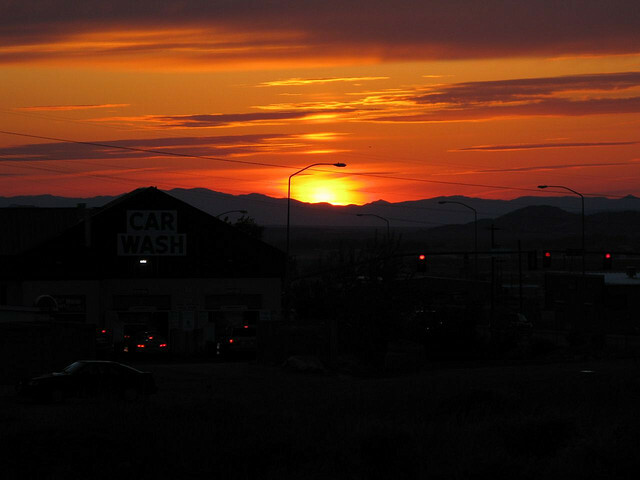 The day was getting away from me and I needed to get to Cedar City. Utah was an hour ahead and dinner was at 6:30. I got gas in Baker from an automated pump (there were no people there) and declined the $2 add on for a shower. From Baker, NV to Millford, UT was truly a boring stretch of road. I’m now traveling with the grain of the mountains, so it’s all valley for 80 miles. 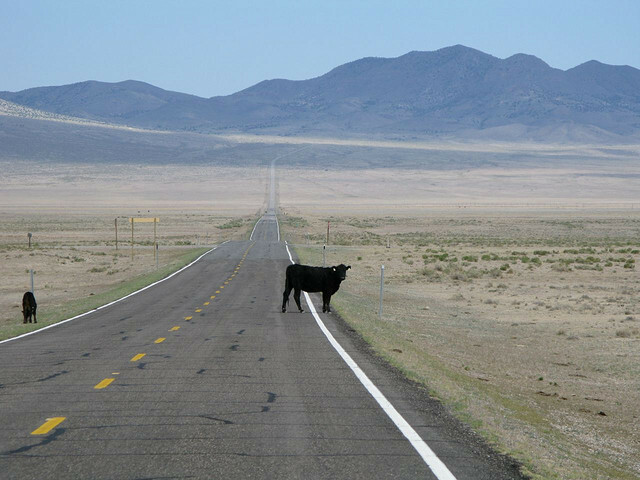 Cows sometimes think it’s cool to sit in the middle of the road. Why I dunno. This is all free range ranching and the cattle guards on the road are a good reminder that bike->cow is not a good thing at speed. 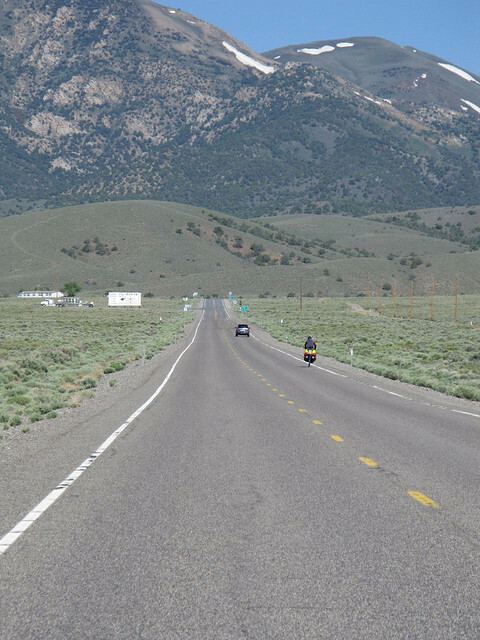 What I could not fathom though is that in this 80 miles of nothingness the number of bicycles that were out there. No water and hot for that distance didn’t seem like a great combination for cycling. I passed some 10-15 bikes on that leg. I arrive in Cedar City just a few minutes and it’s good to see some familiar faces and get to know some new ones. Not many of us came from the Bay Area as did in prior years, but a few of us were there. I had dinner with Scott and Gary from Salt Lake and it was good to get a bit of local knowledge. Both met via the online forum and became good riding buddies. The social implications of the internet are pretty cool. You can find folks around the corner, across the nation and world that share your passions. To close out the day, I’m finishing my email and the night watchman, Andy, asks about the rally and that he rides a bike… yeah I know where this is going. We swap road tales and soon it’s midnight. Got to get to bed as I still haven’t swallowed the hour time difference yet.